Reporter claims he entered palace after paying a "Buckingham chauffeur"
LONDON, England (CNN) -- A royal chauffeur was suspended Sunday after he allegedly allowed undercover reporters from a British tabloid to enter Buckingham Palace in exchange for cash. 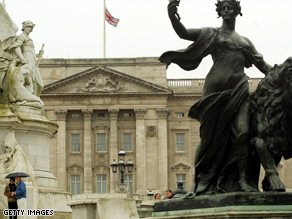 Buckingham Palace has been the subject of high-profile security breaches before. Mazher Mahmood, of the London-based News of the World, claimed he was allowed to enter the London residence of Queen Elizabeth II without security checks after paying a man identified as a Buckingham chauffeur £1,000 ($1,591). Footage of the incident filmed undercover showed the chauffeur giving Mahmood, whose face was blurred, a tour of the royal garage and, at one point, allowing him to sit in one of the vehicles. A palace spokesperson told CNN that the chauffeur "has been suspended pending further investigation." British media named the chauffeur, but CNN could not independently confirm his identity. Meanwhile, Mahmood's editor, Robert Jobson, told ITN: "Nobody stopped him, nobody actually challenged him. It actually exposes a serious lapse in security at Buckingham Palace." Jobson added that even senior members of the royal family and longtime staffers are required to present photo identification cards upon entry to the palace. "Our investigator is sitting where the queen sits in the royal limo," Jobson said, referring to the video. "And the fact is, we've been told that security has been tightened up, that these things wouldn't happen again, new rules and regulations were brought in -- they simply haven't worked." A spokesman for Scotland Yard told CNN, "We are naturally concerned about the issues raised by this story and are liaising with palace officials about their staff security arrangements." A police statement issued to CNN later Sunday said: "We are naturally concerned about the issues raised by this story and are liaising with palace officials about their staff security arrangements." Buckingham Palace has experienced a number of high-profile security lapses in the past. In 2003 an investigation was launched after "comedy terrorist" Aaron Barschak gatecrashed Prince William's 21st birthday party at Windsor Castle, PA reported. Wearing a dress, beard and sunglasses, Barschak climbed on stage as the prince addressed the crowd, and kissed him on both cheeks. That same year, a journalist with the Daily Mirror newspaper spent two months "working undercover" as a palace footman.